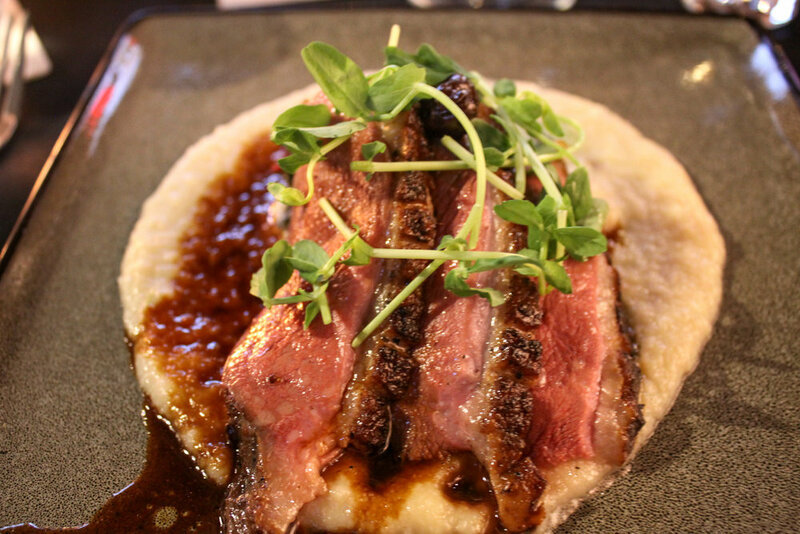 Whiskey Kitchen is not just your typical downtown bar. With its unique vibe, tasty plates, crafted cocktails, and extreme collection of whiskeys from all over the world, this contemporary Southern kitchen has a lot to offer the Raleigh community. Co-owned by Jeff Mickel and Michael Thor, these two work together with their attentive team to create a memorable experience each time you walk into the open garage door entrance or take a seat at one of the picnic tables on their heated patio. 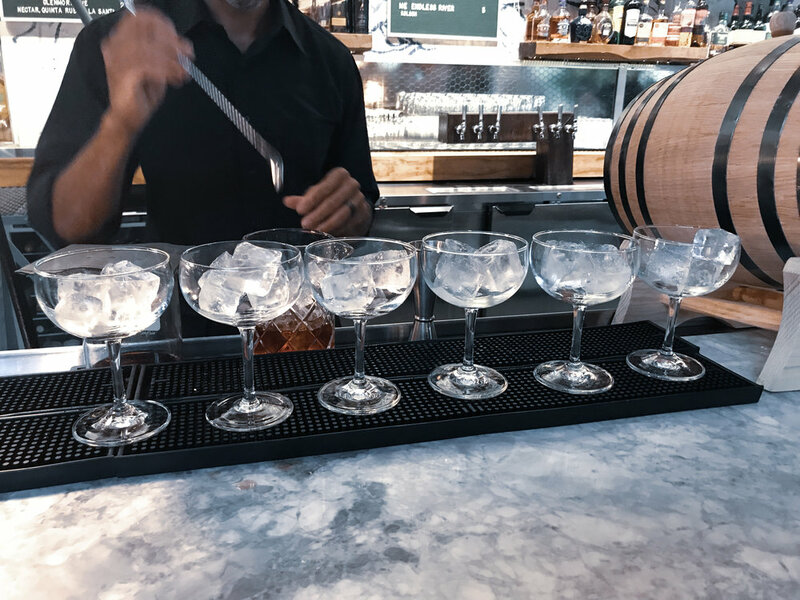 In combination of their love of spirits, smoked plates, open air, and friendly service, a night at Whiskey Kitchen will be well spent. 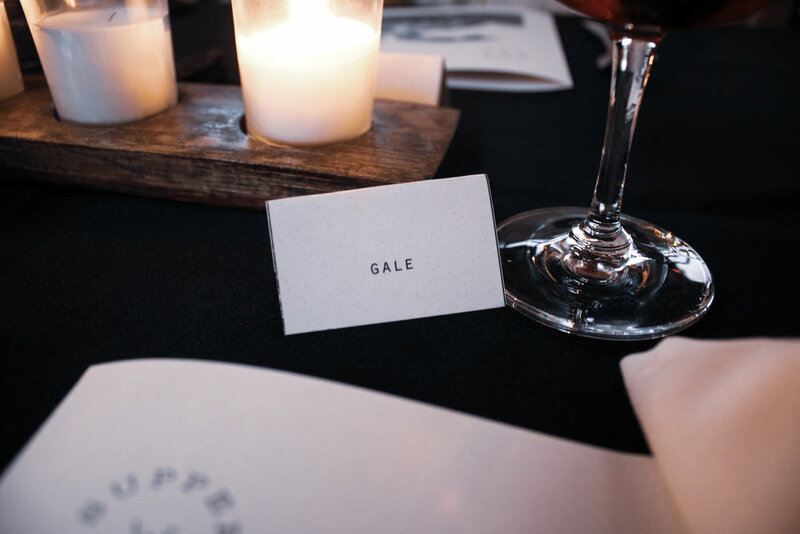 Supper Clubs are Whiskey Kitchen's way of playing with and celebrating the exciting things that happen when food and whiskey get together. 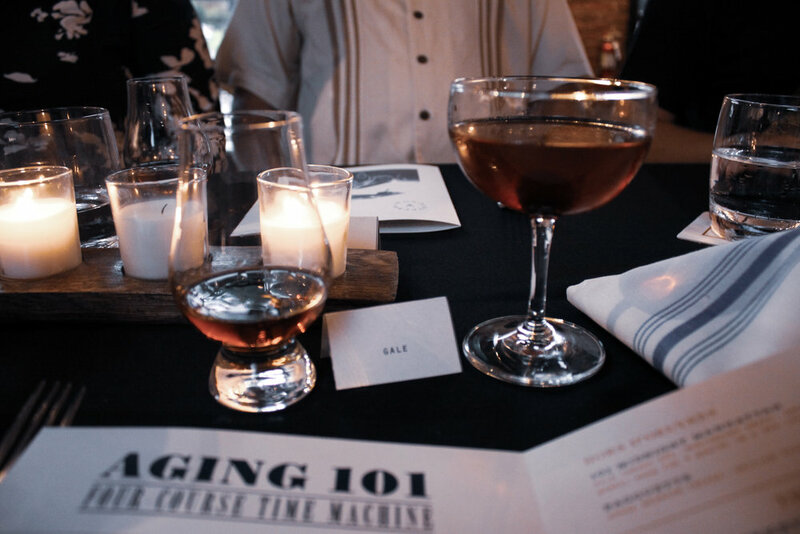 This particular Supper Club focused on age, and how it affects both whiskey and food when different techniques are applied. While we waiting for the show to begin, guests were served 101 Midnight Manhattan's. These cocktails were served straight from the barrel and were comprised of Wild Turkey 101, Montenegro Amaro, Angostura Bitters... all barrel aged for 4 months in a new charred White American Oak barrel! It was freaking delicious, y'all. Pretty soon, our first whiskey came out - Wild Turkey 101 extra aged for six months in a new, charred White American Oak Barrel. To be completely honest with you, I went into this thinking "I love whiskey! This will be magical!!" I very soon learned that whiskey to mean is Jameson + Ginger. While these aged whiskeys were absolutely wonderful, I could only take a few sips. I did drive, after all! My table mates were likely stoked on this as I passed my serving around to them after sampling. The first (food) course of the meal was Shrimp and Grits. Doesn't look like your average shrimp and grits? 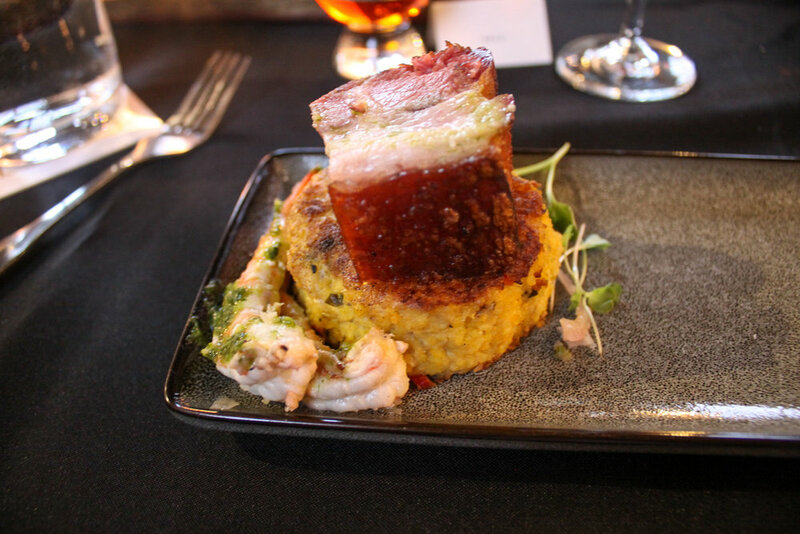 That's because it featured house cured maple smoked pork belly. In the words of JVN: YES HUNNY! A large part of me wanted to request like 3 more dishes of this because it was just that good! The dish also featured chimichurri which made my day because I am a firm believer that everything in life is better with a little chimichurri! The next whiskey served was Wild Turkey 101 with a Pinot Noir finish that has been aged for 3 months in a new, charred White American Oak barrel then 3 months in a charred barrel used to age Pinot Noir. Talk about a time commitment! When I saw Pinot Noir AND whiskey together, I was stoked. However, It def didn't taste like wine but was still yummy, nonetheless. Our second course of food was Double Oaked Duck. This dish featured oak barrel stave and smoked duck breast, barrel rested Pinot Noir and cheer sauce, Farmer's Collective rainbow chard (always here for a good chard), cauliflower puree, and smoked maldon salt. Just when I thought nothing could get better than the Shrimp & Grits... GLORY. The duck was so good I begged the rest of my table to eat some of theirs. Hi hi person in charge at Whiskey Kitchen, can this always be on the menu?! To be able to eat the 4th and final course, I am pretty sure I ended up running around the block about 3 times to make room for the last round of whiskey and dessert. When they brought out the Wild Turkey 101 with Bieler Rose Finish, I don't even think I tried it because I was starting to feel the effects of all the whiskey consumption throughout the night! My neighbors enjoyed my portion, however. This is not a dis on any of the whiskey throughout the night, however. Again, I was driving and knew that a little bit for me goes a long way! Dessert was the most beautiful portion of Peaches and Cream I've ever seen! Barrel rested rose marinated local peaches, almond sponge cake, brown butter almonds, and peach cream mousse -- freaking YUM!!! All in all, I left the the most full belly and an even fuller heart. The whole night reminded me of why community is so important. At first, I was a little apprehensive to be sat with people I didn't know, who seemed way older than me. Then, one whiskey in, we all started talking and had the most beautiful conversations the rest of the night. Whiskey Kitchen's Supper Club brings together people from all walks of life, puts them at long, family style tables, and let's them enjoy a meal together -- something we don't do nearly enough of. Sound like your kind of party? Keep your eyes pealed for the next Supper Club! They are held quarterly and cost $75. Honestly, you've wasted $75 on worse so def consider it!